Perfect to thwart or prevent terrorist attacks, or other crimes carried out by using any improvised explosive devices (IED) that is, explosives remotely controlled via radio impulse. 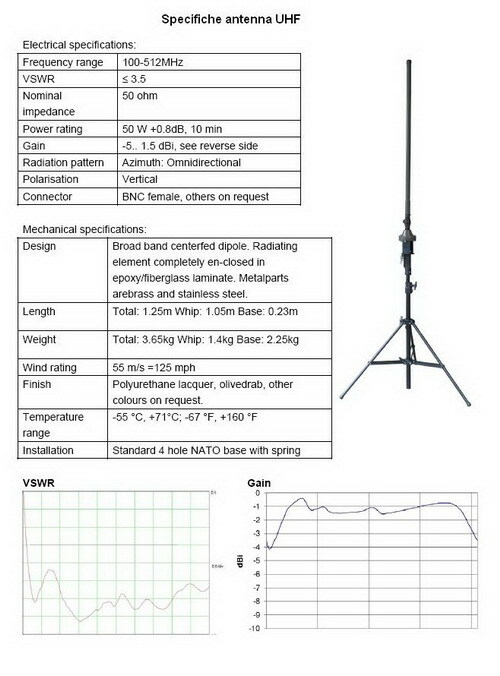 Also suitable to protect areas of strategic interest against GSM-UMTS signals. One of the techniques mostly used by terrorist organizations for attacks against military or civilian targets is the one that massively uses the so-called “Improvised Explosive Devices” (IED), that is, radio-controlled explosives such as car bombs, suicide bombers, and in general any remotely operated ordnance. Because of the peculiar difficulty in detecting in real time, hence in neutralizing, this kind of devices, it is becoming more and more common to use a special type of electronic scramblers, called “jammers”, whose function is to cancel the impulse that triggers the bomb, sent via radio from a remote source, thus preventing it from detonating. In other words, the signal emitted by our bomb jammers allows you to effectively disturb the remote triggering impulse, and to prevent the explosion. Low-power jamming systems are suitable to provide a point-to-point protection, suitable for small groups of personnel or vehicle convoys, on a short distance (between 30 and 100 meters), while high power jammers can cover distances between 100 and 300 meters, or more. 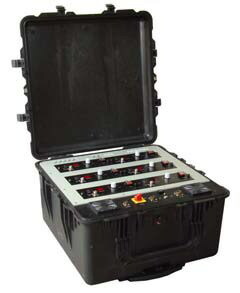 The high power VS-160W bomb jammer fits into the latter category, and can be used in various contexts. 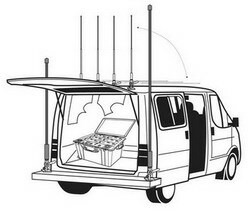 In particular, the jammer can be used as a signal scrambler, both for GSM-UMTS mobile phone signal and for wide band UHF and VHF radio equipment, on a long distance. 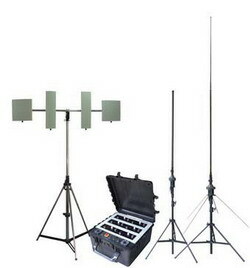 Thanks to its 160W output power, in fact, the VS-160W signal jammer is capable of neutralizing radio controlled explosives, at a distance of up to 300 meters from the signal source. By scrambling both the UHF radio and the GSM-UMTS signals, it achieves a 100% percentage of success in its jamming operations. 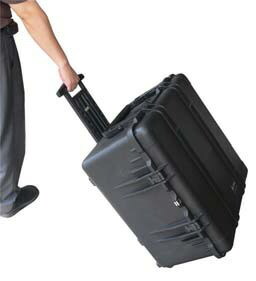 The trolley case for the high power bomb jammer makes it easy to carry the device around with no problem. Many European countries, ban the sale within the UE. Check the regulations in force on its own territory before proceeding with the information request. 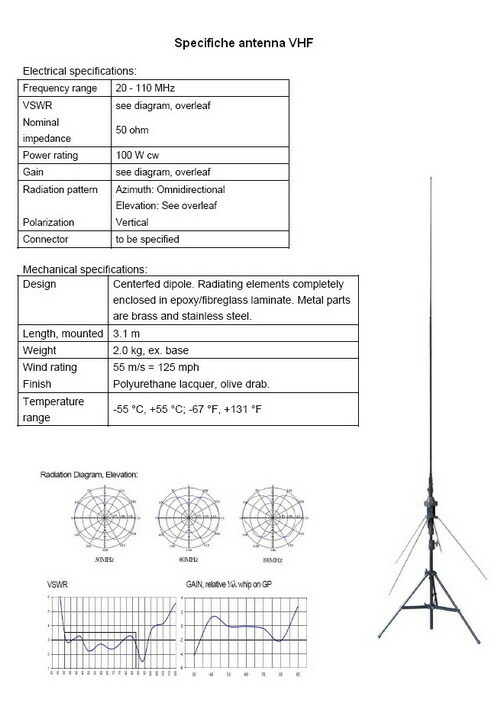 On the left side you can see the board-shaped GSM-UMTS antennas mounted on a tripod, while on the right side you can see the UHF and VHF wide band radio frequency antennas.